Jung Suk Won of Rooftop Prince revealed the scene from the set. On March 29th, 2012, Jung Suk Won tweeted on his Twitter account, “Hey, I actually dance. You can see it on Rooftop Prince (episode 4) tonight at 9:55pm on SBS,” and published a photo. Jung Suk Won is playing the role of warrior guard Woo Yong Sul for crown prince Lee Gak (Park Yoochun) in Rooftop Prince, showing his almost foolish domineering. The gang of crown prince who traveled through 300 years of time, is expected to undergo humiliation of dancing. 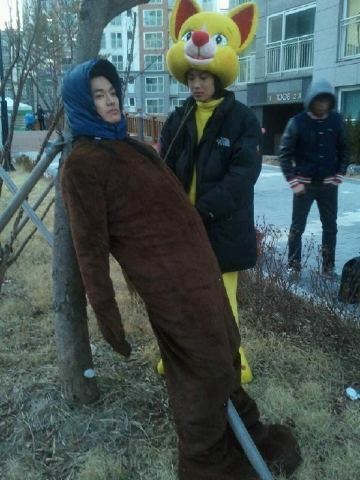 Netizens commented, “What is the cute hat about?” “Or, wearing the animal hat to do part time job?” “Ah, hilarious. Today will stay tuned” and so on.